NEW YORK (AP) – Organizers of the world’s largest St. Patrick’s Day Parade say they’re ending a ban and allowing a gay group to march under its own banner for the first time. The parade committee, in a statement made available to The Associated Press (and other media outlets, including peoplesworld.org), said on Wednesday that OUT@NBCUniversal, a lesbian, gay, bisexual and transgender support group at the company that broadcasts the parade, would be marching up Manhattan’s Fifth Avenue on March 17 under an identifying banner. It’s unclear how the group was chosen: whether OUT@NBCUniversal, which is described on its website as “the affinity group for LGBT & Straight Ally employees at NBCUniversal,” was invited by the organizers or applied. Parade directors voted unanimously to include the group, the statement said. Other gay groups can apply to march in future years, spokesman Bill O’Reilly said. In the past, organizers said gays were free to march but only with other groups and not with banners identifying them as gay. Most marching units in the parade carry identifying banners. There are about 320 units in next year’s parade, the committee said. 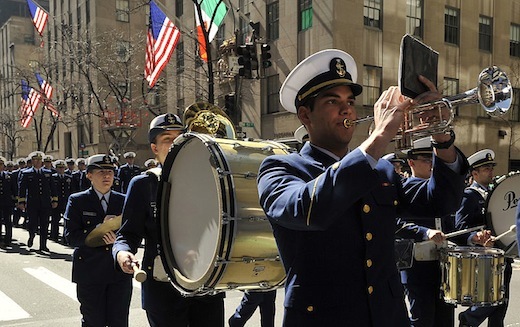 The statement said the parade was “remaining loyal to church teachings,” and O’Reilly said Cardinal Timothy Dolan, who is to be the parade’s grand marshal next year, was “very supportive” of the change.